Victory in war is universally desired, but defeat also has its uses. This is especially true if one believes the aim of politics is not merely to win elections, but also to drive one’s opponents from political life. In that case, defeat can be more useful than victory. Victories unite nations. Even opposition politicians can usually claim a share of the glory. Defeats frequently divide people, and the blame that inevitably accompanies defeat can be skillfully used to irremediably discredit rivals. Some opposition politicians will always find the destruction of domestic political enemies more satisfying than the defeat of any foreign foe. For these, military defeat, if not sought, will always be welcome. My talk will examine three themes. The first is the way that explanations of the 1940 French defeat were used to gain political advantage. This would result in the creation of many myths. The second is a brief examination of the purely strategic and tactical deficiencies that led to the rapid French collapse. The third is a discussion of the broader and overarching failure of French governments, and the French nation, to meet the German threat when it was still able to do so. Both the military errors of 1940, and the larger problem of lethal French passivity in the decade before the war, were ignored by the mythmakers of post 1940 France. The reasons for this are obvious. A purely military failure could not be blamed on any political group. Criticism of the failure of will to act against Germany in the decade before the war indicted too many, and was therefore equally useless. Truth is frequently the first victim in the pursuit of political advantage. The uses of defeat had already been demonstrated well before the Second World War. The Second Empire had been destroyed, and the Third Republic born, in the midst of France’s 1870 defeat by Prussia. The effects of the First World War had been more dramatic. None of the governments of the defeated Central Powers had survived. Military collapse had allowed revolutionary leaders who could never have succeeded under other circumstances to seize power. The defeat of France in 1940 would have a similar result. But for some supporters of the new Vichy State, the destruction of the Third Republic was not enough They also had to destroy the reputations of their erstwhile republican opponents. This they believed would enhance the legitimacy of the new regime. It would also provide a long awaited revenge. This of course did not stop defeated republicans from blaming their Vichy rivals for the defeat. They too were already creating their own myths, which they hoped would provide future advantage. Certainly, the collapse of France in six weeks was the greatest surprise of the war. The nation had been expected by almost everyone to hold out against the Germans for years. The ability to do so had been presumed by France’s defensive strategy. Few could believe that the rapid collapse of a large, well equipped army was the result of military incompetence. Some socialists and Communists were quick to assume that the generals, disillusioned by the 1936 Popular Front government, had betrayed the Republic. Others, seeking more ideologically satisfying explanations, blamed capitalism, clericalism, and the “two hundred families“ that had figured so large in French Marxist mythology in the 1930s. (The two hundred families referred to the largest share holders of the Banque de France, who alone had voting rights, and who were therefore assumed prior to 1936 to dictate French monetary policy. They were synonymous with the most powerful industrial and financial interests in the country.) For those newly triumphant at Vichy, the causes of defeat were equally obvious. Anti-clericalism, parliamentary corruption and the Marxist parties that had divided the nation were to blame. It is possible to sympathize with those who wanted to find deeper causes for the catastrophe that at first seemed to have determined the future of France. It is also understandable that political leaders would seek political advantage. However, all the explanations about fundamental weaknesses causing the collapse were greatly exaggerated. France had not gone to war divided. The anger created by Popular Front reforms had largely been submerged in 1940 by a grim determination to win the war. Marcel Déat’s subversive question, “Why Die for Danzig?” had ultimately had little effect. Nor was France betrayed. As recent literature on the war demonstrates, France was defeated because her generals had made serious mistakes during the campaign. Robert Doughty put it best when he wrote that the Germans “outfought the French tactically and outsmarted them strategically.“ They had also had an inordinate amount of luck. France instead had been a victim of its own military doctrine. The French officer corps had entered the First World War with a belief that only offensive warfare could bring victory. The nation as a result had suffered terrible losses. 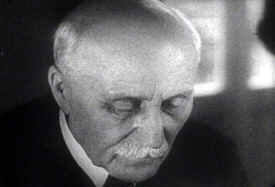 By the late 1920s, when Marshal Philippe’s Pétain was Vice President of the Conseil Supérieur de la Guerre (CSG), his fear of the murderous effect of firepower on infantry and assumptions about the advantage of the defense, combined with the obvious need to husband French lives in future wars, had come to dominate French military thinking. It would continue to do so through 1940. The French plan is well known. The general staff understood that France’s greatest weakness was the concentration of industry in the north. They therefore planned to advance deep into Belgium early in the campaign to establish defensive positions as far from the French border as possible. 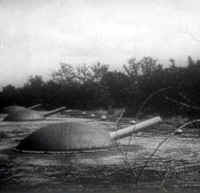 Once entrenched, French artillery and antitank weapons would then be able to inflict heavy casualties on the attacking Germans. French offensives, when they occurred, would be carefully prepared. Allied strategy was based on the importance of maintaining a continuous, unbroken front against the enemy. In order to preserve that front, the army could only be allowed to move forward slowly, as part of what the French called a methodical battle (la bataille conduite). General Maurice Gamelin’s one audacious gambit, the so-called Breda variant, in which he decided to move still farther into the Netherlands, depleted his strategic reserve. This fatally weakened the French. When Guderian’s panzers broke through the Ardennes, there were no strategic reserves left to stop him. Nor were there many to take advantage of the German exposed left flank as they wheeled north to cut off the allied troops in the Low Countries. 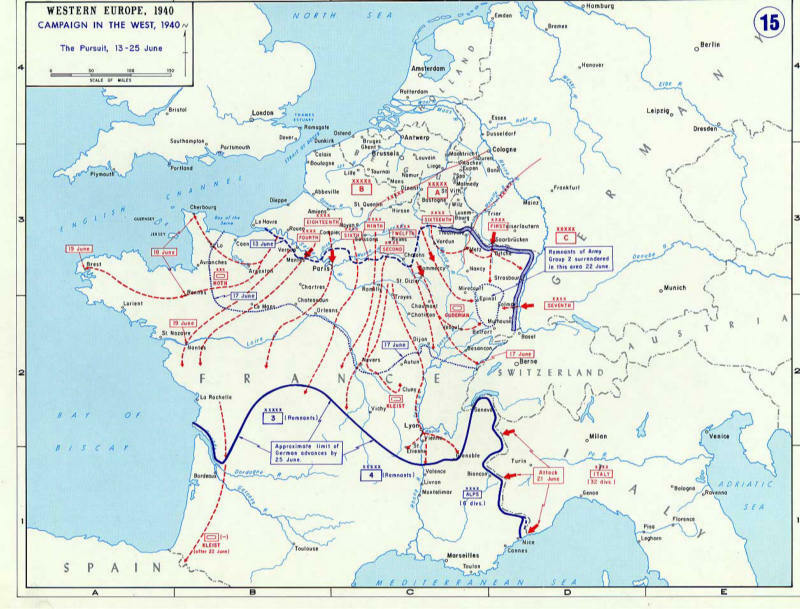 French attacks when they did occur were uncoordinated, and hampered by poor air cover. 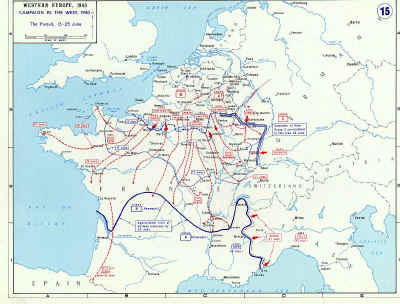 By the time the French were prepared to strongly resist the subsequent German move south, the battle was already lost. Stanley Hoffman has famously called Vichy the “revenge of the minorities.” The Riom trials, begun in February 1942, were part of that revenge. The aim was to discredit the country’s pre-war Socialist and Radical-Socialist leadership. The indicted included former premiers Lé on Blum, Edouard Daladier and Paul Renaud, interior minister Georges Mandel, air ministers Pierre Cot and Guy La Chambre (the former in absentia), and former commander in chief Gamelin. Pétain had already decreed that no other officer would be charged. The army was not to be criticized. France’s diplomats were similarly exempt. The Germans expected the defendants to be found guilty for declaring war. 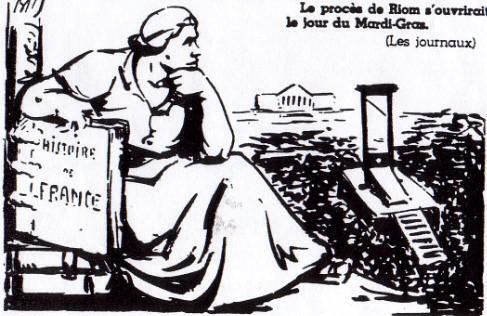 "Louis XVI en avait fait beaucoup moins..." "Louis XVI did much less of it..." Dessin de Bils / La France socialiste, 6 janvier 1942. The Vichy regime, avid for political advantage, wanted to convict them of losing it. The prosecution charged that Popular Front reforms such as the 40 hour week and nationalization of some industries had fatally weakened the country’s arms program. 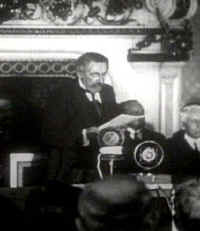 Léon Blum argued that industry had worked furiously despite the new regulations, and that the aim of the government’s nationalization had been to modernize arms manufacturing, especially airplane production. More importantly, Blum were able to prove that the largely defensive strategy that had defeated France had been in place since at least the late 1920s. The effectiveness of the defense led to the trial’s indefinite suspension in April. The German defeat at Stalingrad little less than a year later made debate over 1940 less important. With allied victory a growing possibility, French interest turned to the nature and extent of collaborationist guilt. However, the signal fact remains that for two years after the armistice every political group was wed to some kind of mythologized explanation for the defeat.. No one was willing to see the military failure for what it was. But the most striking aspect of this exercise in willful blindness was not the Riom trials. It was rather the refusal to seriously consider why Germany had been allowed to become so strong in the years prior to 1940. The greatest failure of the French republican regime had not been its inability to stand up to the German attack. It was its unwillingness to act against the growing Nazi danger when there was still time to do so. The peacemakers at Versailles had left Germany permanently disarmed. France retained a legitimate right to intervene to insure the maintenance of the treaty. The slow sapping of French will to insure their own security through military action was what really doomed the Republic in 1940. There were several reasons for this lethal French passivity. The international hostility to the 1923 occupation of the Rhineland, and the fears this created about the possibility of future borrowing in American and British capital markets, was one. The 1926 Locarno Treaties that had guaranteed the permanence of France’s eastern borders was another. German entry into the League of Nations the same year was a third. By the time the 1928 Kellogg-Briand Pact renouncing aggressive war had been signed by Germany, French politicians were ready to court voters with dramatic army reductions. That year Radical-Socialist War Minister Paul Painlevé , in cooperation with Marshal Pé tain, reduced military service to 12 months. Reducing offensive capacity was a rational response to a peaceful Germany. Premature surrender to a yet unachieved German military revival was not. The bill for the construction of the Maginot Line was adopted in January 1930. France would begin building a shield even before Germany had forged a sword. Germany was no longer to be subdued. Instead, it was to be contained. Aristide Briand had already told the Chamber of Deputies that “one cannot continually control a nation of 60 million people.” Few had thought to ask, why not? This fatalistic attitude would continue to grow in the years that followed. The departure of the allied arms commission that had accompanied German entry into the League had removed the last effective body able to monitor disarmament. The Germans were quick to take advantage of this. However, this by itself did not pose a fatal danger to France. The unwillingness of French governments to do anything about it did. The triumph of a defensive strategy supported, in the words of one author, ” by Pétain out of conviction, and by Painlevé for reason of political ideology,” was thus complete years before Hitler came to power. The doctrine that the destructiveness of firepower gave overwhelming advantage of the defense provided plausibility to this policy. There is also no doubt that this strategy, which required neither initiative nor sacrifice, was warmly supported both by the French public, and the political establishment. What did it matter how strong the Germans became? They could never become powerful enough to breach impregnable French defenses. They could only destroy themselves trying. It had become French strategy to hope that if war came, Germany would take the offensive. France’s allies were not so sanguine. Hitler’s coming to power had obviously increased their danger. 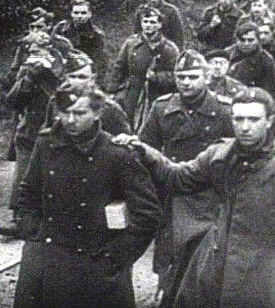 If the French political establishment remained unwilling to take aggressive military action, Polish leaders were not. In the Fall of 1933 Marshal Josef Pilsudski discretely proposed a joint Franco-Polish preventive war. After consulting the government, Maxime Weygand, who had replaced Pétain as Vice President of the CSG, replied that France could not support any Polish initiative. Neither domestic nor foreign opinion would stand it. Weygand himself had probably been in favor. He had insisted through the 1920s that France keep an intervention force in permanent readiness, and had already made himself unpopular by suggesting that bloodshed was occasionally necessary to keep the peace. New proposals for preventive war came the following year from a Belgian senator. “Why not a preventive war?” Weygand had told the Belgian ambassador. “Today France has the military advantage. Soon she will not.” In the end, once again, nothing was done. France instead began seeking allies against Germany. Coalitions were to replace determined action. In 1934 Louis Barthou engineered an alliance with the Soviet Union. 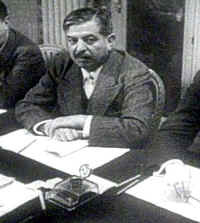 His successor Pierre Laval created the Stresa Front with Britain and Italy the following year. Dependence on coalitions would ultimately lead to moral and political bankruptcy in 1938 at Munich. The remilitarization of the Rhineland in March of 1936 marked France‘s last opportunity to act militarily against Germany. A French invasion would have had the German army scrambling back across the Rhine, and perhaps have led to Hitler‘s downfall. Instead, mindful of foreign opinion, and especially British opinion, which strongly opposed military action, the French government lodged a protest with the League of Nations. At the same time, a cautious Gamelin, recently made commander in chief, did everything possible to restrain the politicians. Optimists claimed that Britain’s pledge to defend France against aggression, which had only been given to prevent French unilateral action, was a better guarantee of security than a demilitarized Rhineland. It was nothing of the sort. By convincing themselves that British help was necessary to defeat Germany, French governments made themselves prisoners of British policy. Britain had never had the same commitment to German disarmament as France. The 1935 Anglo-German Naval Agreement had been the first important breach of Versailles’ restrictions. The foolishness of French dependence on Britain was later demonstrated at Munich. Chamberlain returned to Britain in triumph. Daladier, who had followed the British lead, felt himself disgraced. British plans to fight a long war of attrition with Germany, similar to that in the First War, became equally worthless after the Nazi-Soviet Pact in August 1939, which allowed Germany free access to the Soviet Union’s resources. In 1936 France might still have defeated Germany alone. In 1940 the French and British armies together were defeated by the Germans. A new series of trials would follow the end of the Vichy regime. Some aspects of Vichy rule had clearly been criminal. But just as the Riom trials had concentrated on the immediate causes of defeat, without examining the greater failure of national resolve to destroy the Nazi menace early on, so the post-war trials that indicted Pétain and Laval for their moral failures under Vichy ignored what had been their greater military and political failures under the Third Republic. Marshal Pétain at his trial had declared that since he had been unable to be France’s sword, he had at least been determined after 1940 to be its shield. This attitude may have been commendable in the immediate post-armistice period. But he had already become convinced France needed a shield long before it was necessary. His contribution to the “Maginot spirit”, and with it the destruction of the will to destroy the German threat, had thus contributed not only to the defeat, but ultimately to the horrors of the occupation. Laval, a much more subtle thinker, had also contributed to the defeat from 1935 on through the coalition building that was made a substitute for decisive action. Collective security would ultimately prove worthless when none of the partners had the will to fight. When in 1939 resolve was at last found, it was already too late. The passivity and defensive spirit that Pétain and Laval had supported had also been widely shared by the French political leadership and electorate. They were not crimes. Yet they were the fundamental causes of the tragedies of 1940 and afterwards. The great mistake of French politicians of all stripes had been to treat Germany after the rise of Hitler as just another nation, with sovereign rights to rearm and garrison its own territory. The law of nations and international opinion had demanded this. However, Germany after 1933 was not like other nations. It had been the duty of French political and military leaders to recognize this, and take appropriate military action. This would not have been popular at home, as General Weygand discovered. It would almost certainly have been roundly criticized abroad. Containment had been a much more popular strategy, because it required less effort, and potentially no loss of life. It also suited the inclination of a democratic nation like France never to begin wars, but only to respond to the aggression of others. However, containment did not work. Germany under Hitler had enormous territorial ambitions in the east that it would not yield under any circumstances. Containment had therefore simply allowed the German army to increase its strength without restraint, and then choose the time and place of attack. 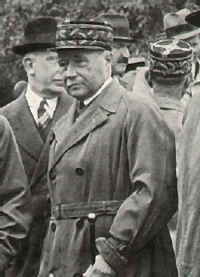 General Gamelin, like Pétain and Laval, had been one of the chief supporters of a defensive strategy long before it had become appropriate. 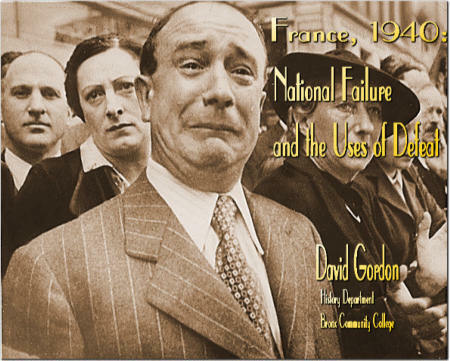 At Riom, the most abject of the defendants, he had said that the 1940 defeat had been the final result “of all French domestic and foreign policy since 1919 … The whole nation had paid for so many accumulated mistakes.” In this, unfortunately, he was right. David Gordon received his M.A. and Ph.D. from Brown University, and is the author of two books, Merchants and Capitalists: Industrialization and Provincial Politics in Mid-Nineteenth Century France, and Liberalism and Social Reform: Industrial Growth and Progressiste Politics in France, 1880-1914, as well as several articles and chapters on African and European economic history. He has taught at the University of North Carolina at Chapel Hill, the University of California, Riverside, and the University of North Carolina at Charlotte. He also taught for two years at Kaohsiung Teachers University, Taiwan, and was a seminar director at the Ecole des Hautes Etudes, Paris. Professor Gordon is working on a study of European and American economic and political activities in interwar China. He is currently a member of the History Department, Bronx Community College, City University of New York, the CUNY Graduate Center and of the NYMAS Board of Directors.. He has also lectured on America First, the 1940 anti-war movement, and Charles Lindbergh, available on this site.